From the towering river bluffs of Castle Rock to the expansive wetlands of the Green River Lowlands, dozens of high-quality remnants have persisted through decades of grazing, fire suppression and alternative priorities. Here, in these gateways to presettlement Illinois, you will find the passion of the Middle Rock Conservation Partners. Each site, unique and extraordinary, requires ongoing stewardship, research and review, all by unwavering volunteers. Although each site has retained a diverse inventory of plants and animals, the encroachment of invasive species is a major concern. 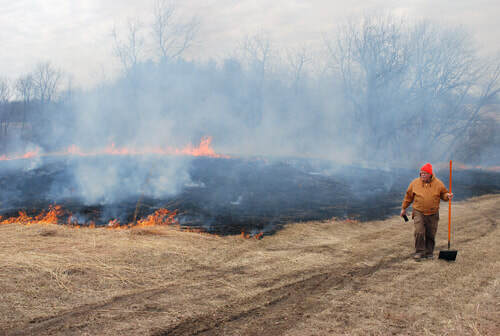 While some can be controlled with prescribed fire, a crucial tool for successful land management, others are constantly monitored and managed with hand tools or selective herbicide application. Several invasive species, the Big Ten, need many years of treatment to remove from a site. A high-quality remnant is a sight to behold. By visiting multiple times a year, one can experience the seasonal turnover of life: the spring migration of flittering warblers and ephemeral woodland wildflowers, the towering Silphiums of summer prairies and the brightest of blue gentians tucked amongst the tufts of prairie dropseed in early fall. It is amongst these sights and sounds, volunteers gather native seed in the hundreds of pounds, each seed destined for dispersal into degraded habitat or the beginning of a new restoration. Working with public and private landowners, the Middle Rock Conservation Partners strives to better what remains of the original Illinois landscape. Led by knowledgeable land stewards, scheduled work days are open to all who wish to be part of this landscape-scale mission, protecting and preserving the wild spaces of North Central Illinois. During the growing season, May through October, weed management and seed collection are crucial activities to sustain the biodiversity in high-quality parcels and new plantings. Stewards and volunteers target individual species for removal or collection with ample opportunities to learn about the landscape. As the seasons change, so too does the work. When the days grow shorter and plant life falls dormant in preparation for winter, typically in November, the focus turns to prescribed fire and brush control, which continues through winter until the following May. Winter workdays often consist of chainsaw work, felling trees and bucking limbs, removing invasive brush and chemically treating the stumps to prevent regrowth. Crews may also work on firebreaks to preparation for dormant fire season. ​Would you like to help MRCP fulfill its mission? No prior experience is necessary. All activities will be discussed and demonstrated at the start of the workday. Sign-Up to Volunteer and tell us what activities interest you. As workdays approach, we will notify you our request for help. In addition, you can find all workdays on the Scheduled Workdays page.